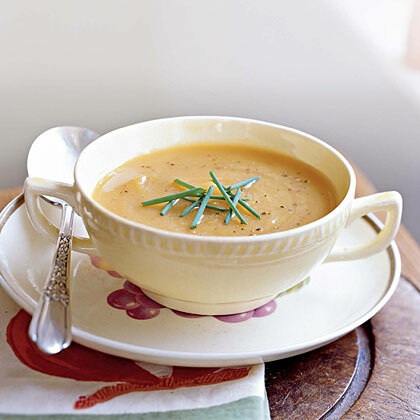 I am a huge fan of butternut squash and started making this recipe for Roasted Butternut Squash and Shallot Soup from Cooking Light Magazine last year after I got my Le Creuset "happy" pot. It is hands down one of the best butternut squash soups I've ever had. It's not sweet, but wonderfully savory with the shallots. I literally make it once a week and can't get enough. And, this recipe is SO easy to make. It just doesn't get any easier! As I've mentioned before, I'm a HUGE fan of roasting and roast my vegetables in my toaster oven. The caramelized flavor that roasting gives is far superior to steaming, in my opinion. Adds so much to the dish! I love serving the soup with a dollop of Greek yogurt. Really adds depth to the flavor. I buy butternut squash from Trader Joe's that has already been peeled and cut. It makes this recipe even faster and easier to make! I also use the low-sodium chicken broth from Trader Joe's ... it's the best tasting and lowest-sodium broth I've found available in the market.